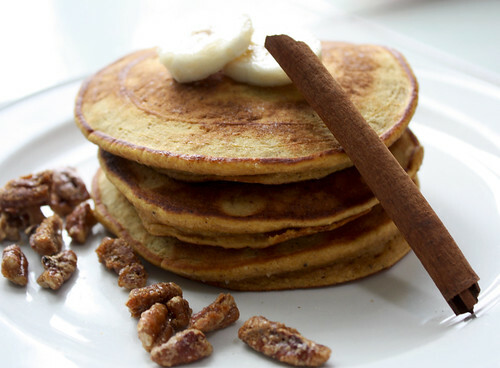 I had a few people over for breakfast, and made these awesome banana pumpkin pancakes. My friend E is obsessed with pancakes, and with a nickname like 'The Pancake King', you know he is a man who likes his pancakes. And, when 'The Pancake King' tells you that your pancakes are the best pancakes he has ever had, you can't help but feel proud. 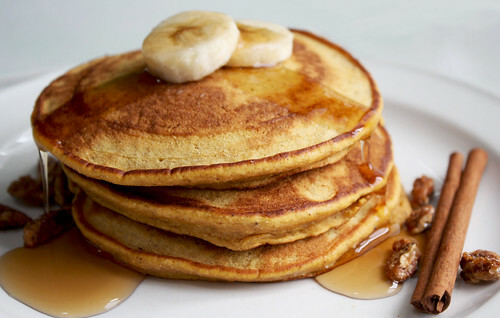 These pancakes are very filling, and the bananas add a nice touch of sweetness. I made some candied pecans to go with the pancakes, and it was a winning combo. Although the spices seem more than plenty when reading the recipe, the spice taste is in fact very mild and not overpowering. Just try them, they seriously rock. This recipe yields 6-10 pancakes (depending on size of pancakes). 1. In a bowl, combine all of the dry ingredients and mix well. In another bowl, combine the olive oil, pumpkin puree, ginger, egg, and milk and mix well. 2. Add the wet ingredients to the bowl of dry ingredients, and mix until smooth. Add the bananas, and mix with a spoon until the bananas are evenly distributed throughout the batter. 3. Heat a lightly greased skillet on medium heat. With a small ladle or large spoon, scoop the batter onto the pan (about 4 inches diameter), and heat until the top begins to bubble or until you can flip the pancake without making a mess. Heat the other side until golden brown. Repeat Step 3 until the batter is used up. WOW!!! Those look so darn amazing!!!!!! Great pics. My mouth is watering... I wish someone would make me that for breakfast tomorrow morning!!!! Those pancakes look great. I really like how they have chunks of banana in them. I'm definately going to have to try them out. Thanks for the recipe. I just made these pancakes for my kids in honour of Hallowe'en - yumm! One guy said "Well they don't have to be just for Hallowe'en do they mom...?" Thanks for the new twist on one of our favourite breakfasts. Thanks so much for your feedback. I'm glad your family enjoyed them as much as mine. My husband loves these. i put a little almond butter and used agave for the syrup. Love them !!! Wow! 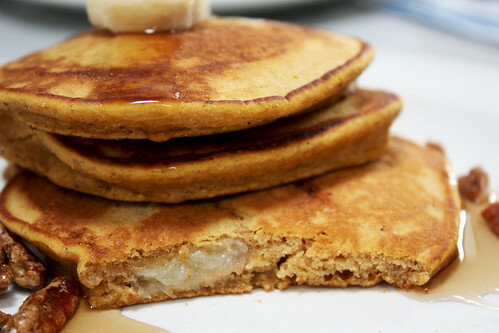 This is awesome Banana Pumpkin Pancakes! Its so easy to make. If you wont mind I'd love to guide Foodista readers to your post. Just add the foodista widget to the end of this post so it will appear in the Foodista pages and it's all set, Thanks! I saw your blog link in Foodista. Thanks for adding that food widget. I checked out your other blogs too and they are all great. You can add foodista widgets to your old and new blogs too so foodista readers can visit them.